Developer Firaxis has revealed that the next nation to be added to the Civilization VI roster is *fanfare* Nubia. The latest addition is based around production bonuses, which fits with their chosen leader; Queen (or rather,Kandake) Amanitore. So let’s take a look at the Nubian kingdom, its tradition of badass Kandakes and why Amanitore is a strange choice of ruler for the civ. First off the bat, Amanitore wouldn’t have known herself as the leader of the “Nubians”. Amanitore was the Kandake of Meroe; the capital city of the Kingdom of Kush (or Kushite Kingdom). Nubia referred to the region in which Kush was based, though it wouldn’t be recognised as such until the fourth century, about three hundred years after Amanitore lived. The word Nubia is derived from the Noba people, who settled in the region after the collapse of Meroe. Although Amanitore’s reign saw an increase in building (hence her in game attributes, I guess), the kingdom was actually in a state of decline. The area enjoyed an extremely close relationship with their neighbour, Egypt. Egypt saw Nubia as a trade corridor to Africa, and as such were friendly to the multitude of smaller kingdoms that made up “Nubia.” Egypt referred to the region as “Ta-Seti” (Land of the Bow), which explains why the civ’s unique unit is an archer, and where the devs got the name for the civ’s unique ability. Relationships with Egypt might have turned less amiable during the Egyptian Middle Kingdom (2040-1640 BC) when Egypt decided it would be easier to just control Nubia, rather than use it as a trade route. But despite a sudden increase in military fortifications across the border, the garrisons continued to enjoy peaceful relationships with the Nubian locals. For a long time, the two nations were indistinguishable, until the kings of an area called Kerma decided to push back. They had the potential to destroy Egypt (but chose not to) and began to unify the Nubian region under their kings. When Egypt pulled back, the Kingdom of Kush was formed in it’s wake; culturally it was very similar to Egypt, and it had considerable power over their Egyptian neighbours. In the eighth century, they invaded and controlled Egypt, until the Assyrians knocked them back, forcing them south, where they established their capital in Meroe. Amanitore was one of a tradition of ruling warrior queens. 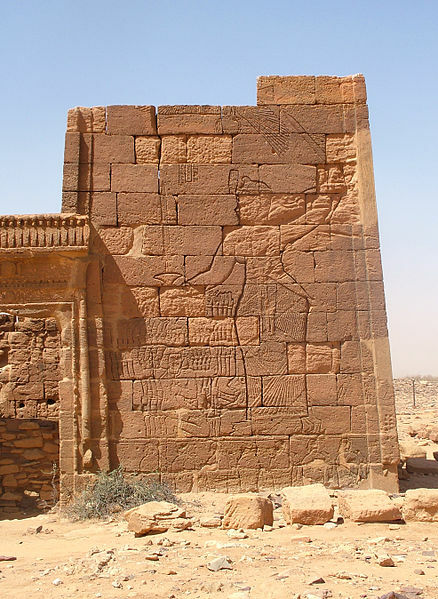 Whereas Western tradition tends to have queens as the mother or wife of kings, in Meroe a Kandake could rule alone, with her husband as her consort, rather than the king. The earliest of these queens was Shanakdakheto, who ruled without a king even though she had a husband and a son. Images of Shanakdakheto show her in battle, wearing armour and wielding a spear, starting a tradition of warrior queens which is seen in her later successors. The Kandake Amanirenas led the Kushite armies during a war with the Romans over a period of five years, even though she was blind in one eye. Her immediate successor, Amanishakheto also led the armies that defeated a Roman invasion force come to conquer them. She was known, specifically as, the ‘warrior queen’ and also happened to be one of the wealthiest of the Kandakes. Under Amanishakheto a number of temples and pyramids were built, and when she died, it was with considerable riches and jewels. Amanishakheto was succeeded by Nawidemak, of which little is known, but given that she was also buried in a lavish pyramid with depictions of her sheltering the God Osiris, we can assume that she was not outrageously different from her predecessors. 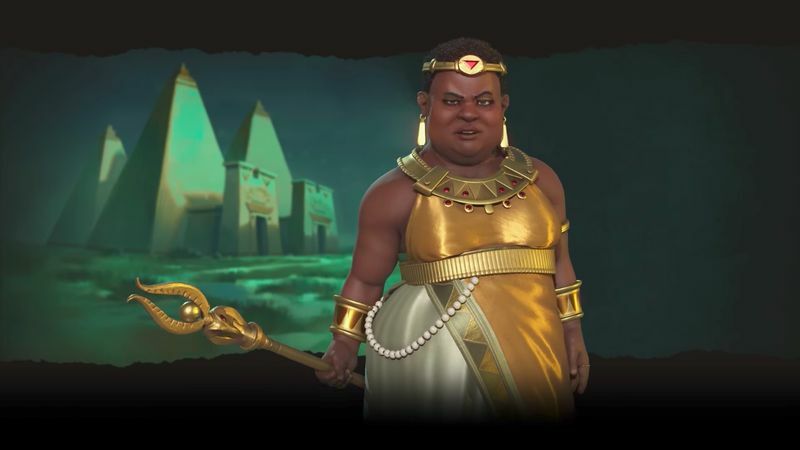 Given that Amanitore was from a line of warrior queens praised for their strong and athletic build, it seems strange that she would be depicted in Civ as…well…somewhat overweight. Especially when there are plenty of Western rulers in the game who were actually overweight but enjoy a far leaner characterisation. Queen Victoria and Catherine the Great, who lived to old age and were quite large as a result of their lavish diet and increasing lack of exercise, are shown in the prime of their youth. While Amanitore, who was probably athletic and who would have died before the age of fifty (her exact dates are unknown, but we do know that her reign and that of her successor totalled no more than forty nine years), is shown as older and overweight. Appearances aside, Amanitore did not rule in her own right as the Kandakes before her had. Her relationship with her co-ruler Natakamani is unknown. Either he was the son of the ‘warrior queen’ Amanishakheto and therefore Amanitore was his wife, or Amanitore was his mother who ruled in his stead while he was young, and then at his side when he was old enough to succeed. Whatever their relationship, Amanitore and Natakamani were equals and were known as the last great builders of Kush. This was partially because they were the last rulers of Kush before it went into decline in the hundred years following them, and because they did actually build a hell of a lot. Under the pair, two hundred new pyramids were built, along with reservoirs in Meroe. They also refurbished two temples dedicated to the Egyptian God Amun, one of which had been almost completely destroyed by the Romans, and dedicated a number of new temples to him. While Amanitore is not specifically known for leading armies into a particular battle, unlike some of her predecessors, there are surviving depictions of her quashing her “enemies”, suggesting that she did play her part in defending the kingdom. The Kandakes that followed (whether co-ruling or in their own right) were also known for upholding the warrior queen tradition. So, if Amanitore specifically went against this, there might have been some record of it, as it would have been more note worthy that she didn’t fight, than if she did. Amanitore messing up her enemies. Also about all we have to go on for her appearance.